Introduction: The recent Zika virus (ZIKV) outbreak has resulted in over 500,000 suspected and 200,000 confirmed cases in North, Central, and South America and the Caribbean since 2015. Cases have also been reported as far as Vietnam and Thailand. In addition, 29 countries have reported microcephaly or other neurologic malformations suggestive of congenital ZIKV infection. Patients with Zika Congenital Syndrome (ZCS) may demonstrate neurological findings including microcephaly, facial disproportionality, cutis girata, hypertonia, hyperreflexia, intracranial calcifications, macular retinopathy, and sensorineural hearing loss. Craniofacial abnormalities including micrognathia, short thyromental distance, and abnormal craniocervical shape may make airway management more difficult. Abnormal craniocervical shape may be secondary to overlapping of cranial sutures and flattening of the posterior fossa, an abnormality that has been previously described. The Pediatric Retinal International Surgical Mission, a multidisciplinary group including anesthesiologists, ophthalmologists, and nurses, was formed to examine the epidemiology of ocular disease associated with ZCS in a rural area in the Dominican Republic. Methods: Mothers of infants who presented for ocular exam were surveyed regarding ZIKV like symptoms during pregnancy. Data on infant head circumference (HC) and weight at birth, as well as at time of examination, was also collected. 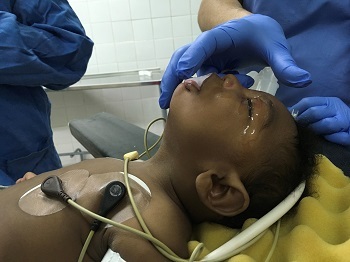 Two microcephalic infants unable to tolerate ocular exams without anesthesia were taken to the operating room for exam under anesthesia (EUA). Results: The first infant (Figure 1) requiring EUA was noted on preoperative assessment to have decreased frontal-parietal development with a flattened occiput. The mandible was retrognathic with decreased thyroid-submental distance. An egg-crate foam pillow underneath the occiput was necessary to align the airway. After application of an electrocardiogram, pulse oximeter, and non-invasive blood pressure cuff, inhalational induction was performed with 100% O2 and 6% sevoflurane. An oral airway was utilized to prevent airway obstruction in the setting of the small retrognathic mandible. Given the lack of a side stream CO2 analyzer at the facility, adequate ventilation was assessed by mask vapor and continuous auscultation of breath sounds by a pediatric intensive care nurse. The infant tolerated the entire 10-15 minute EUA with mask ventilation. The second patient for EUA (Figure 2) showed craniofacial disproportion notable for a protuberant occiput, short neck, and mild retrognathia. 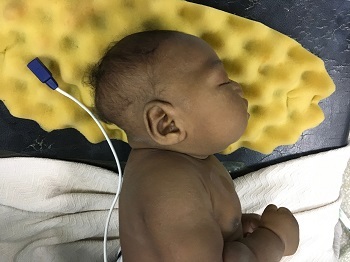 This infant required a shoulder bolster to align the airway appropriately. An oral airway was also necessary. This infant underwent an uncomplicated EUA with inhalational induction and mask airway maintenance. Given the limited resources, neither infant had an intravenous (IV) line placed. Discussion/Conclusion: Both infants were maintained under general anesthesia with mask ventilation alone, without IV access, and underwent uncomplicated EUAs. Although confirmatory laboratory testing is not available, the time frame, epidemiological situation, and symptomatology of our cases are consistent with ZCS as the most likely etiology for the infants’ microcephaly. As many patients with abnormalities of ZCS may present for medical care in highly resource limited areas, our experience may allow providers in these areas to safely care for similar patients, despite concerns regarding the safety of airway management with the associated craniofacial abnormalities.